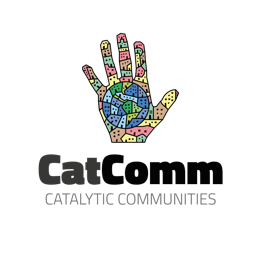 This article is part of RioOnWatch’s #VoicesFromSocialMedia series, which compiles perspectives posted on social media by favela residents and activists about events and societal themes that arise. Torrential rains and flash floods have rocked Rio de Janeiro, taking a heavy toll on the city at large, including its favelas. The downpour on the evening of Monday, April 8 continued overnight and into Tuesday evening, killing at least ten and leaving several others missing. 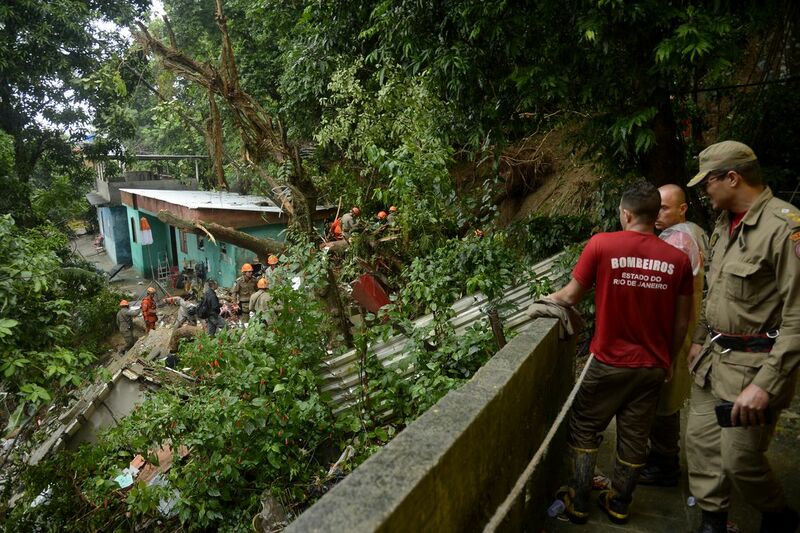 Amid landslides, fallen trees, and crumbling roads, Mayor Marcelo Crivella declared a state of emergency on Monday evening, closing schools and advising residents to avoid leaving their homes. As rain sirens sounded throughout the city, many favela residents found themselves in danger. This week’s catastrophic rainfall, the strongest recorded in Rio in 22 years, marks the second in just over two months, as landslides in early February left seven dead. Rio’s City Council recently launched a Parliamentary Commission of Inquiry on Flooding to improve public accountability for disaster prevention and response. Crivella, who told journalists on Tuesday morning that such levels of rainfall are “atypical,” blamed the city’s lack of preparation on previous administrations. Local and international media were quick to point out, however, that Rio has seen a steep decline in public spending on flood control systems since Crivella assumed office. Indeed, the Municipal Conservation Secretariat (SECONSERVA) authorized no new spending between January and April of this year. Globo breaks down spending by Rio city hall on urban drainage (by year in which works were carried out). Numerous favela communities saw lives, homes, and property destroyed. RioOnWatch surveyed social media reports from favela activists and residents across the city. The following should be considered a nonexhaustive list, as favelas citywide saw extreme damage and loss. At the bottom of the page, you can find resources for donating to affected communities. A landslide in Babilônia, in the city’s South Zone overlooking Leme beach, killed sisters Doralice and Gerlaine Nascimento as a landslide buried them in their home. Following a search-and-rescue effort, Gilson Cezar Cerqueira dos Santos—who appears to have attempted to help the Nascimento sisters—was also found dead. Babilônia’s rain siren was not activated because rain levels did not reach the required minimum of 45mm/hour. Crivella later announced the city would revise its siren protocols. According to residents of Vidigal, which overlooks the Sheraton Hotel and is neighbor to Leblon beach, the local rain siren blared throughout the day. The favela also saw its central byway, Avenida Niemeyer, become completely impassable. The hillside between Cantagalo favela and the beachfront neighborhood of Ipanema saw landslides impacting Ipanema’s residential buildings. On Tuesday afternoon, local media confirmed several additional deaths, including that of Guilherme Nascimento, a resident of Parque da Cidade—a small favela community located next to Rocinha, in Rio’s South Zone. Firefighters found Nascimento’s body trapped underneath a car in the high end next door neighborhood of Gávea. On Twitter, Rocinha residents posted videos and photos of floodwaters surging downhill. “Rocinha is always punished by the rain, given its geographic location and lack of basic sanitation works. In this video, a woman is stranded and at risk of being swept away by the rainwater,” wrote Rocinha community journalist Michel Silva. 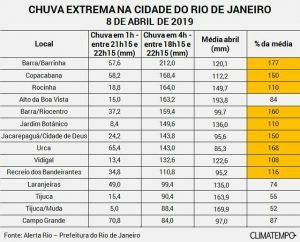 According to City Hall, multiple favelas in the city’s South and West Zones saw four-hour rainfall levels surge well above monthly averages. The severe rains did not only affect favelas, however. The entire city was hard hit. 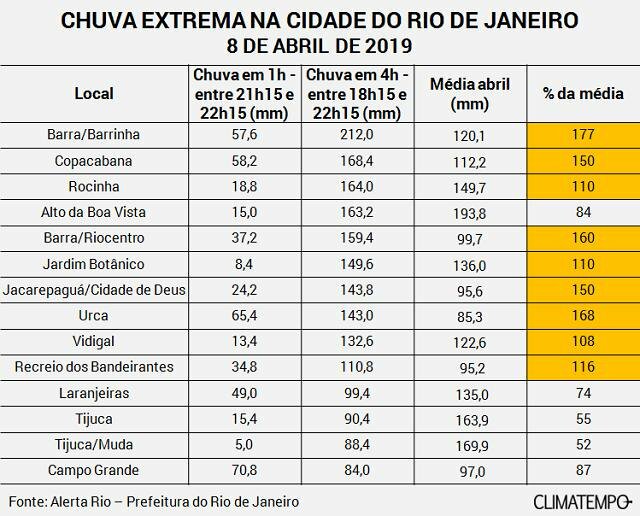 Jardim Botânico, home to the city’s Botanical Gardens as well as the headquarters of Globo, saw some 150mm of rainfall in under four hours, more than anticipated for the entire month of April. And a grandmother and grandchild, along with their taxi driver, were found buried after the storm in Botafogo, the heart of Rio’s South Zone. As hourly news programs looped footage of submerged cars and stranded buses in Jardim Botânico, favela residents, particularly in other regions of the city and region, lamented the disproportionate coverage. 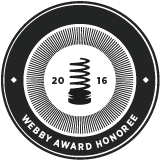 “Globo‘s media coverage is only for…the South Zone. 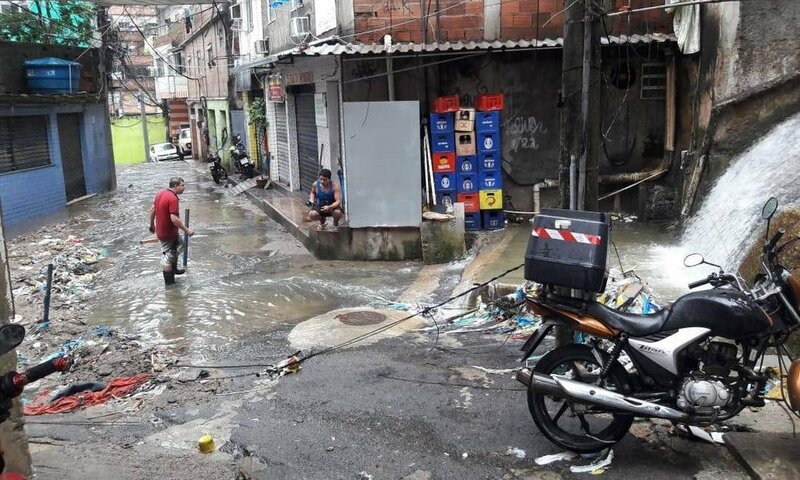 Guaratiba, Rio das Pedras, and Campo Grande [in the city’s West Zone] are still being punished by the rain and we see nothing in their so-called ‘coverage.’ This is abandonment in every sense of the word,” wrote one resident. Others from the West Zone shared footage of a flooded market in the Rio das Pedras favela, with rainwater at waist-level and entire stalls ruined. Antares activist Jessé Andarilho posted a video from his mother’s house, calling on residents across the city to help with donations. The favela of Muzema saw rivers form in the streets, overturning cars and destroying cobblestone roads. Residents of Indiana and Borel reported that an improper construction project by a nearby school had interrupted the regular flow of water exiting the Tijuca National Park. Irregular currents thus flooded the community rather than flowing into the neighboring Maracanã River. ATENÇÃO Muitas casas já entraram água em Manguinhos, o Rio a muito tempo já transbordou. moradores estão ilhados em suas casas. O medo é constante. Quem tiver mais informações mande nos comentários. Tuesday evening, Cavalão reported a second landslide. None were hurt. This article was written by Edmund Ruge, and published on April 10, 2019.